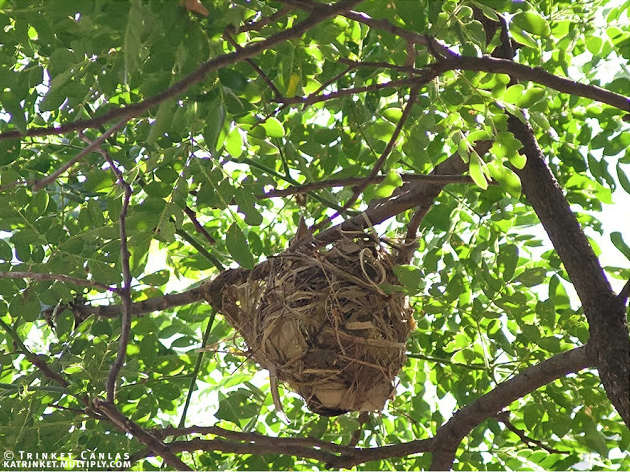 IT’s nesting season and wbcp member trinket canlas shares with us her nest observations complete with photographs and videos. The month of May is usually associated with school summer vacation, fiestas, and afternoon rains to usher in the coming rainy season. This past May, I was able to participate in several guided trips which allowed me to observe something that I will now always associate with this month: the nesting of resident birds. Adri and I were fortunate to have been able to document these nests with Adri taking videos and myself taking photos. It all began with a bird and tree walk for the Ateneo community held in the Loyola Heights campus. It was organized by the Ateneo Environmental Management Coalition and was facilitated by the members of the WBCP and the also by the Philippine Native Plants Conservation Society, Inc (PNPCSI) led by Anthony Arbias (also a member of the WBCP). 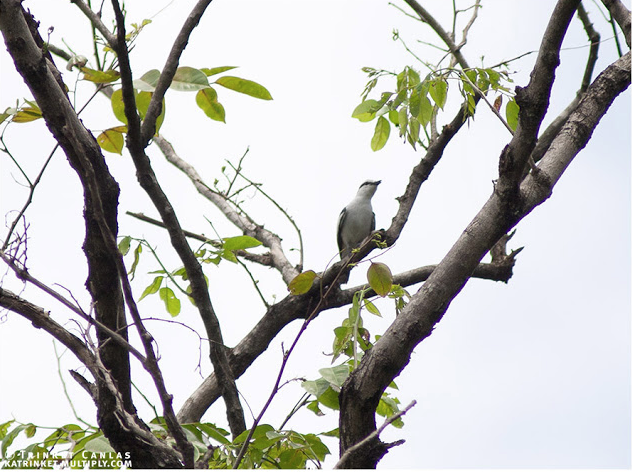 While the group was admiring a pair of Long-tailed Shrikes, one of the more common birds on campus, Jops spotted it returning to its nest. The shrike’s nest was very well hidden behind the leaves of a Mahogany tree, right by the sidewalk of a very busy road! The nest was cup-shaped made of loosely woven grassy material. It was easy to point out because the shrikes also made use of a long piece of blue plastic straw, and it hung from the branches making a convenient marker. The shrikes also made use of other discarded plastic packaging also. The nest contained a single young bird and the young shrike looked like it was ready to fledge any day. Its parents patrolled the nearby field, returning regularly to the nest to feed the lone chick. On another nearby Mahogany, we spotted another nest several meters up which looked like an older, used shrike nest. A few meters across the field, another long-tailed shrike pair was busy feeding an older shrike, already fledged from the nest. 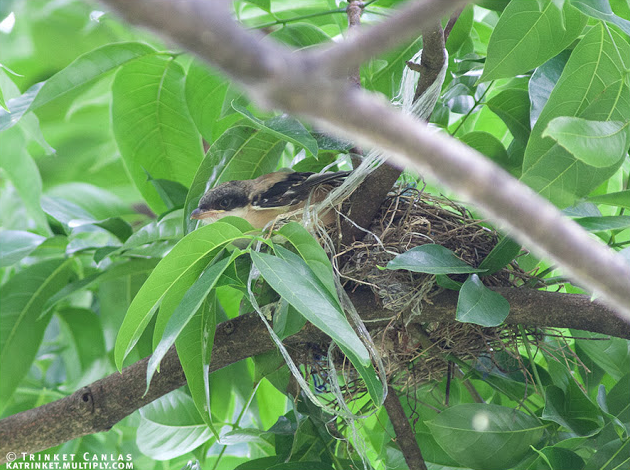 Recently, WBCP and ADMU faculty member Raffy Saldaña had also documented the fledging of two young shrikes elsewhere on campus (unfortunately, one was quickly dispatched by a cat) and the shrikes in my office parking lot had also just recently successfully fledged. Needless to say, Long-tailed Shrikes are a guarantee on campus. They’re literally EVERYWHERE. A week later, I was requested to hold a series of on-campus guided trips for the Biology department undergrads who were taking their ecology classes for the summer. There were almost a hundred students, so we had to divide them into 5 groups, meaning 5 consecutive bird walks! It was a good thing that fellow members Adri, Jops, Maia and Manny helped out! Fortunately, we were able to identify several nesting birds on campus! It was great because it made the back-to-back-to-back-to-back-to-back guided trips much easier! First, because it was almost as if we guaranteed sightings of the birds at specific places and second, even non-birders could not resist the wonder of an adult bird feeding its helpless young on a carefully constructed nest. 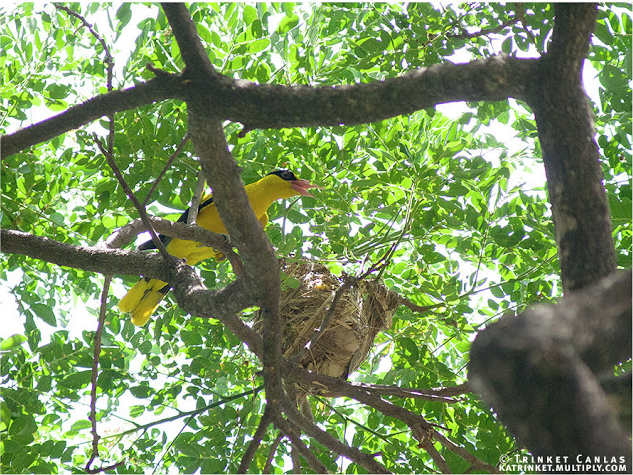 After showing the students the Long-tailed Shrike nest, the second nest we spotted was that of a Black-naped Oriole, a wonderful find because the bright yellow oriole never fails to elicit “oohs” and “aahs” from the participants. This one was waaaaaay high up in a Rain Tree. The nest was made of leaves and twigs and other plant material. Long strips of dried material was used to weave the nest on to the supporting branch, making it very sturdy despite its height up the tree and the wind blowing the branches violently from time to time. The parents left the area for only a few minutes at a time, and it was interesting to note that they were especially aggressive to a Collared Kingfisher which would come and call loudly from time to time. They would arrive on the scene as soon as the kingfisher would start calling and upon locating it, would chase it away (listen for this at around 2:10 in the video below)! The students were also amused to observe the confrontation between the orioles and a pair of Pied Fantails. The birds chased and dove at each other in the high canopy with much energy and display of manoeuvrability. One student compared them to David versus Goliath. 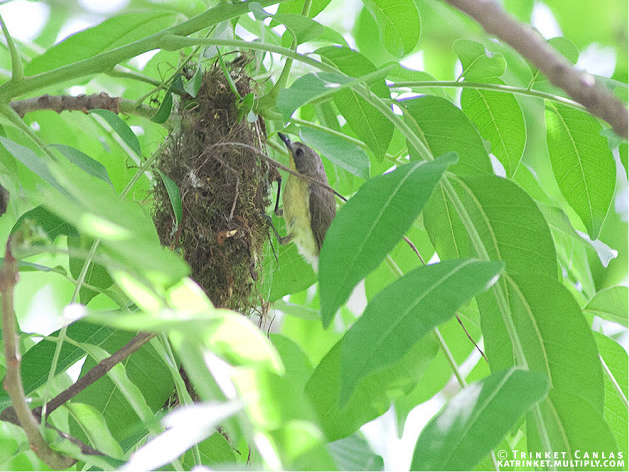 At a much smaller Narra tree beside the huge Rain Tree with the oriole’s nest, we also spotted an old, used nest, placed in a pretty open spot. 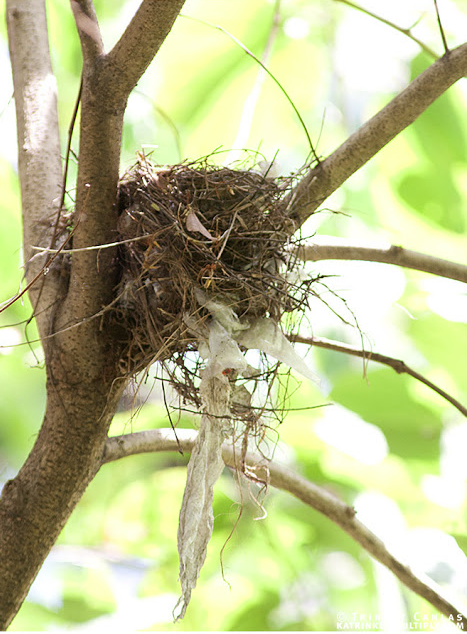 By the looks and material of it (notice the plastic again), it must be a recently used Long-tailed Shrike’s nest. There were at least two adults in the vicinity (need I emphasize again that these shrikes are everywhere on campus?). By our 5th and last trip, the birdwalks were getting shorter and shorter as we now knew where the birds would be. 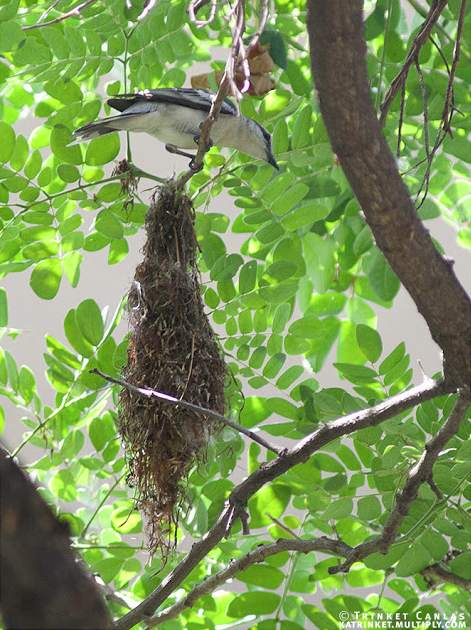 On our way to the oriole’s nest, Manny Illana, whose daughter was one of our students, made another nest discovery! Just by the driveway, on a small tree (this time I’m not sure what species of tree it was) he had spotted a Golden-bellied Fly-eater coming out of a bunch of dried leaves. It turned out to be a nest which was still being built! This nest was a small hanging nest, built very close to the ground. It was made of fresh, softer plant material, what looked like a lot of moss. The adult was still checking the nest out, coming back with new nesting material. Despite its (human) accessibility, it was easy to miss, it blended so well with the foliage and didn’t look like what you would think a nest looks like. The adult was entertaining to observe, leaving and coming back to the nest in almost exactly the same pattern every time. It even led us to see another fly-eater nest, this time way up another rain tree. The nest was already elongated and dry, probably used already. It was taking nesting material from that nest and using to bulk up the new one. Strangely enough, a male Pied Triller was also taking material from that same fly-eater nest! Adri had spotted the Pied Triller the day before, on a tall, nearly bare Narra tree, in the same area. Adri had spotted it because it was also sitting on a tiny nest strategically placed at the base where a larger branch forked out into three smaller branches. We couldn’t figure out if it was an old nest or it was just being built, it looked very flimsy and thin (covered by a leaf in the photo below). We did see the male bird sitting on it on the 2 consecutive days. There was also a female Pied Triller always in the area. Our walk covered only a very limited area of the campus, I loved the thought that all this nesting activity is happening all over the university grounds! A couple of weeks later, both Adri and I found out that nesting was not limited to the ADMU campus! On one of my routes going to the office and back home, we spotted another nest! Cradled on the V of iron bars supporting high tension electric wires was a White-breasted Wood-swallow nest! Two young birds, fully feathered and probably about ready to fledge in a few days, were being watched over and fed by 2 adults. The nest was built along a very busy street, on Magsaysay Avenue at the UP Diliman campus. In fact, construction was going on to improve the pedestrian walk just below the electric pole where the nest was located. We decided to document the nest before work one morning. It was just a little past 7am, but the construction workers and their supervisors were already about their business. After a few minutes, they couldn’t resist taking a peek at what we were doing, and took some time watching the young birds through the scope and on Adri’s camera screen. They themselves commented that the young birds looked like they were probably several days old already, and were amazed that even if the nest was just right above them as they worked everyday, they had never noticed it. How did we see it, they asked? For birders, seek and you shall find. 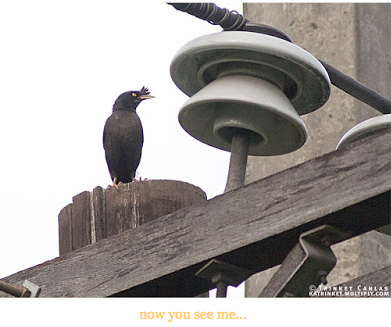 While we were documenting the nest and watching the Wood-swallows, we noticed a Crested Myna flying back and forth several times to a location we couldn’t figure out. Its behaviour made us think that it, too, had a nest nearby. As we were driving home that afternoon, we slowed down by the Wood-swallow nest to check on them and as we drove on slowly, Adri suddenly said, “Ayun ung Myna!” (“There’s the Myna!”) Sure enough, the Myna was perched on top of the second electric pole down from the wood-swallow’s (this one was an old, wooden post). After a couple of seconds, again at the exact time as we drove by the pole, it dropped into the hollow of the pole and disappeared from sight! Mystery solved! The next morning, we were able to squeeze in a few minutes before work (again) to check on our old (well, one day older) and new nest finds. We wanted to try to figure out what stage the Myna nest was at. 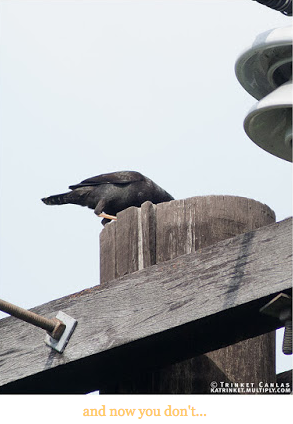 At first, we observed the Mynas carrying in some grass,so we thought that it was nesting material for a new nest. But later, one of the adults flew in carrying a lizard! Was this food for hungry chicks? The next delivery brought in was vegetation again. And then came another lizard, and then more leaves. Later that afternoon, Adri told me that as he processed his video footage, he could hear excited chirps picked up by the camera’s mic as the parents arrived at the nest. 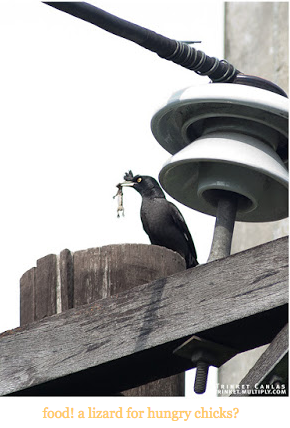 The Mynas, it would seem, are feeding a family. 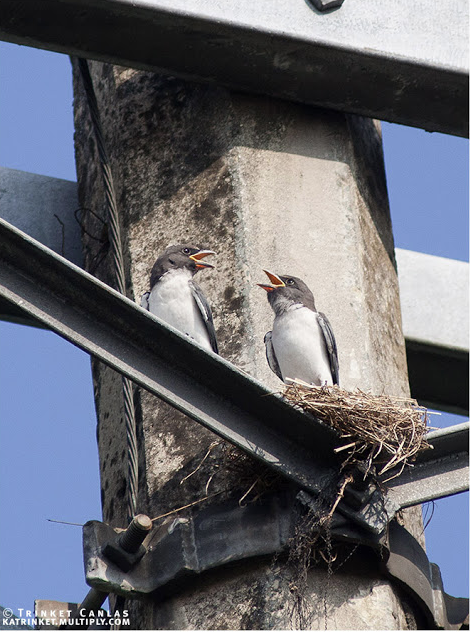 In the meantime, the pair of Wood-swallows were out of the nest and on the top of the next electric pole down the street! They were still chirping noisily and begging from their parents, but it looked like they were in the middle of a flying lesson! The parents would fly from the nest pole to the next pole with the 2 young birds following them, with more agitated and ungainly flapping of the wings. While still a bit unsure in their flight, they were already showing a bit of the aggressiveness and character of Wood-swallows. Back at the Ateneo, the last I saw one of the young Orioles. They were also out of the nest, following their parents around begging for food. The shrikes too, continue to be spotted around campus, noisily harassing the adults, always hungry. After the nesting comes the fledging, a whole new generation of birds in these green oases in the city!